This is something my mother does for her neighbors and is well received! Ramadan is a month Muslims celebrate. A time to reflect, blessings to appreciate. But wait, that’s not all just yet! And that it uplifts and inspires your mood! Print, sign your name, attach to food, deliver:)! If hand making something, list your ingredients. and a link about sharing Ramadan with your neighbors: a snack sharing note, and more tips! The short poem is wonderful! It helps people understand what Ramadan is, and the accompanying food makes for a really friendly gesture. 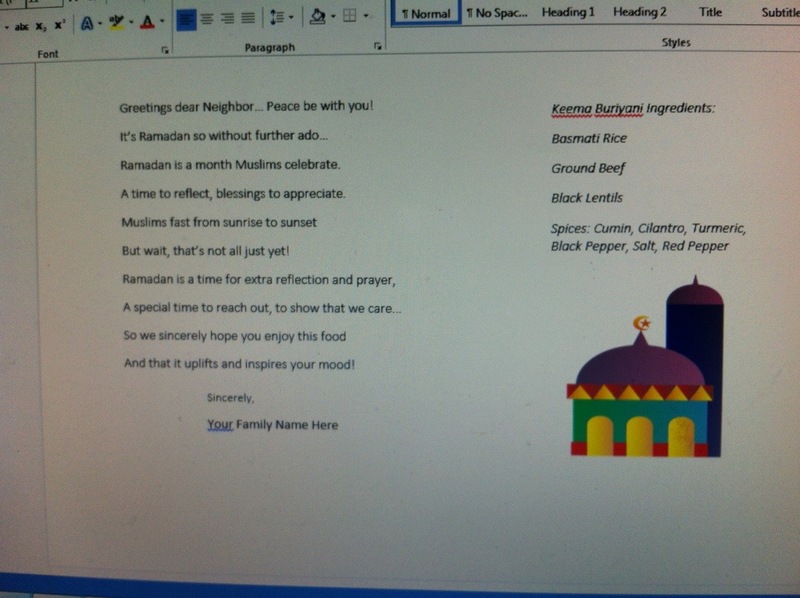 I know that Ramadan has already ended, so I wish you more inspiration for the new poem that you’ll write for next year! thanks so much Rich! I’m happy you liked the poem :). Of course! A good rhyme and a clear message really makes it appealing to me. 🙂 And I must have forgotten, but the recipe on the tag is really smart! The neighbors won’t have to ask you for more of the treats since they’ll know how to make it. Really smart!